Comment on this post, telling my how you think the Mosaic will deepen your walk with Christ and how you anticipate making use of its unique features in your family/congregation/parish/ministry/etc. You can comment up until midnight next Tuesday, October 6th. I’ll announce the winner on Wednesday! Be sure and leave your email addy on the comment form, or I won’t be able to contact you if you’re the winner. If you don’t win here, check out the other blogs on the Mosaic tour for another opportunity! As part of the Mosaic blog tour running through the end of November, I was fortunate enough to get a copy of Holy Bible: Mosaic (please check out my review here) and have the added bonus of hosting a Q&A session with David Sanford, who served as the General Editor for Mosaic at Credo Communications and contributed to the meditation for Christmas, week 1. T.C. : Tell us a little about yourself–faith background, ministry involvement, writing/publishing involvement, etc. David Sanford: I come from a long line of atheists. While I was growing up my father would lecture me: “There are no rules. Don’t obey anyone. Don’t even obey me.” When I decided to become a sold-out follower of Jesus Christ at age 13, however, I discovered my extended family did have a long-standing rule: You can’t be a follower of Jesus Christ. I began to experience my father’s disfavor, anger, and ridicule. My paternal grandparents disowned me. Not quite what I expected, to say the least. At that point, I opened my Bible and began reading. Imagine encountering Scripture’s most famous stories for the first time, without any clue what happens next. That was my experience reading God’s Word cover to cover for the first time. By the end of Genesis chapter 44, for instance, I expected Joseph, Prince of Egypt, to tell his armed guards to slaughter his brothers–men who had betrayed their own flesh and blood years earlier. Instead, in the first three verses of chapter 45 Joseph barks at his guards, orders them to leave, reveals his true identity to his brothers, and then forgives them. I instantly started weeping. How could I have guessed? I’d never seen that kind of love. A decade later, two days before I wrapped up my final exams at what is now Multnomah University, God opened up the door for me to go to work for John Sloan, one of the most respected and successful Christian editors of our generation. Nearly twenty-eight years later, I still love my calling. All told, I’ve seen nearly 400 books and Bible projects published. My wife, Renée, is my witness: My all-time favorite project is the brand-new Holy Bible: Mosaic. T.C. : How did Mosaic have its beginning? D.S. : Like most book and Bible projects, it began with a dream. Actually three dreams. I had the original vision. Tyndale’s Director of Bibles and Reference (Knox Group), Kevin O’Brien, had a similar dream. When we started talking, we both had an amazing “Aha!” moment. I had an initial detailed written proposal, but hearing Kevin’s dream helped flesh it out further. And then his colleague Keith Williams, one of Tyndale’s Bible and reference editors, joined us and shared his vision, which we incorporated, as well. Add nearly a dozen contributing editors, more than fifty writers, dozens of artists and hundreds of writings from every part of the Church around the world over the past 20 centuries, and voilà! T.C. : What was your favorite moment / memory during the creation of Mosaic? D.S. : Definitely getting the first copy hot off the press. Until then, everyone had seen only pieces. The finished product far exceeded everyone’s expectations. Some contributors danced. Others cried. It was that moving. I’ve never experienced anything like that before. T.C. : The quotes, etc. used in Mosaic range the spectrum from Mennonite to Eastern Orthodox, including many outside the realm typically accepted or read by Evangelicals (doubtless Mosaic’s prime ‘audience’). What advice or encouragement would you give readers when reading from sources unfamiliar to them (at best) or from groups they may have been told are explicitly ‘wrong’ about matters of faith (at worst)? D.S. : When you talk heart-to-heart with many evangelicals, you hear a growing longing to be connected to the whole Church (with a capital C). As well, for the past 15 or 20 years there’s been a growing recognition that the historic branches of the Church share what Rex Koivisto, Ph.D., author of One Lord, One Faith, calls “the core of orthodoxy.” Furthermore, we’ve finally recognized we have much to learn from each of those branches. Not because those branches offer something new or different, but because they have so many areas of strength. When we draw from the best of the Church, it’s marvelous. That’s why the name, Mosaic, is so fitting for this Bible and the values it expresses. Still, if anyone is still nervous, I can assure them that all of the writings included in Mosaic are rock-solid biblically and theologically. T.C. : What is your vision / hope for how Mosaic will be received and used? D.S. : The Mosaic Bible features two parts. The last 1,000 pages is the Bible itself, without interruption (except small icons to point out Scripture readings). The first 340 pages feature six-page “weeks.” Each lists Scripture readings, artwork, and writings tied into a specific week and important theme within the Church calendar. I use the term “Church calendar” somewhat loosely, however, since we’ve merged the best parts of various historic calendars into 53 “weeks.” Unlike other Church calendars, Mosaic has an extra week for Easter (since Resurrection Sunday moves around from year to year). Like other Church calendars, Mosaic begins with Advent (repeatedly click the top right corner at http://bit.ly/4qnUFs/). Of course, you can start reading Mosaic anytime. Just visit www.HolyBibleMosaic.com to find out where we’re at in the Church calendar that week. Then jump in. You’ll be hooked almost immediately. T.C. : You wrote the meditation for Christmas, week 1. How did your participation, preparation, and study for this particular devotion affect your walk with Christ? D.S. : I’ve spent months overseas trekking through the Amazon, Andes, Alps, Sahara, etc. Making my way across part of the Sahara was the closest I’ve come to seeing what life might have been like at the time of Christ. If I’ve learned anything overseas, it’s how to wait. I’m probably the only guy in America who thanks God for the privilege of waiting at a red light or thanks God for the joy of standing in a long line at the post office. Over the years, I’ve spent a lot of time meditating on what it means to truly wait versus giving into the “faster!” mentality in the Western world. I’ve also gone back to the Scriptures from Genesis to Revelation and asked myself, “What does God want me to understand about waiting?” It turns out God’s Word has a lot of say about the subject. From Genesis 3:15 on, we find Adam and Eve and millions of other believers waiting and waiting and waiting for the Promised One. By the time of Jesus Christ, most people had given up. But a few never gave up hope. And against all odds, God kept his promise at just the right time. We always think “now” is the best time. That’s rarely the case. T.C. : What is your favorite work of art featured in Mosaic? Why? D.S. : There are scores of wonderful works of art in Mosaic, so it’s next to impossible to pick a single favorite. One of my favorites, however, is the oldest work of art, dated c. A.D. 380. It’s a beautiful Christian mosaic picturing two fish and small loaves of bread. The mosaic is amazingly well preserved. It reminds me of the boy in John 6:8-9 who offered his sack lunch to Jesus. With those five small barley loaves and two fish in hand, Jesus gave thanks to his Father and then feeds the multitudes. I remember hearing my first sermon on that Scripture passage when I was a teenager. I went to a very conservative evangelical church that didn’t believe in prophecy today. But one Sunday the senior pastor, Dr. Lowell C. Wendt, stopped in the middle of his sermon and gave a prophecy. In that prophecy, he said that I would feed multitudes with the Word of God. I’ll never forget that experience. Some thirty-three years later, I believe Mosaic is part of that prophecy come true. What a joy to work on it with some many dedicated brothers and sisters in Christ. Many are now praying that we’ll have the opportunity to create more Mosaic-style Bibles. T.C. : Given the vast possibilities to draw materials from for the weekly meditations in Mosaic, how did the team go about narrowing the field and deciding what to use? D.S. : My hat’s off to managing editor Beyth Hogue. She helped our large team identify what historically important biblical themes should be covered during Advent (4 weeks), Christmas (2 weeks), Epiphany (6 weeks), Lent (5 weeks), Passion Week, Easter (7 weeks), and Pentecost (28 weeks). In turn, those 53 themes were divided up by Beyth among the large team of writers and contributing editors and artists and artistic directors who oversee large collections. In a sense, everyone knew what pieces they were contributing to the mosaic. But we had no idea how well all those pieces would fit together. Then Keith Williams did the final editorial piecing and polishing. The end result is a completely new kind of Bible. Many thanks to David for answering my barrage of questions and sharing his personal insights on the development, vision, and hope for Mosaic! He has graciously agreed to correspond to anyone with further questions and can be contacted at david[at]credocommunications[dot]net. 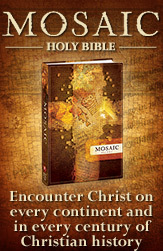 Further information about Mosaic and the blog tour can be found at the Holy Bible Mosaic website. Also stay tuned for a Mosaic giveaway contest hosted here beginning today here!